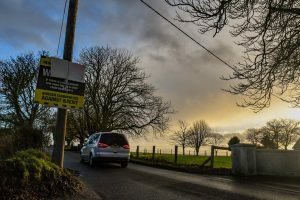 BELCOO, NORTHERN IRELAND — On the short bridge between Blacklion and Belcoo stand two clues that the crossing links not only a pair of towns, but two countries. The road-sign speed limits for Blacklion in the Republic of Ireland are in kilometers per hour. In Belcoo, in Northern Ireland, miles are used. Over the last two decades — particularly since the 1998 peace deal which ended three decades of civil war in Northern Ireland — Belcoo, population 540, and Blacklion, population 194, have are effectively operated as one town. “There are no barriers, it’s how people want it,” said Eugene McCann, who runs a well-stocked grocery store and post office in Belcoo, his hometown.